Are you looking for tips on buying asscher cut engagement rings? If yes, then here are some to your aid. Buying an engagement ring is not as easy as it sounds. 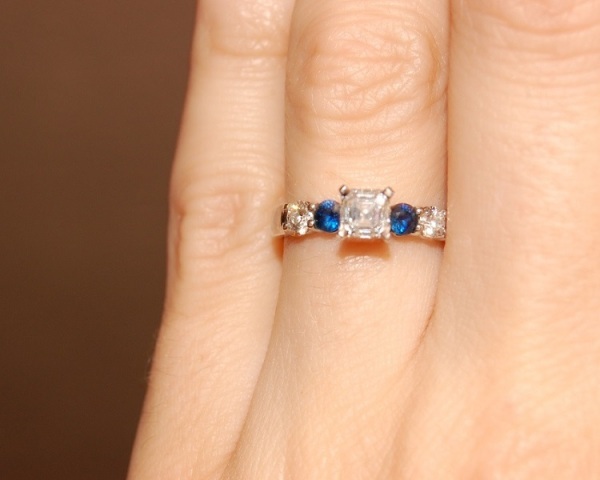 Engagement rings always hold a special significance in an engagement ceremony. The ring is a symbol of love, commitment, trust, and respect for each other. If your engagement is just round the corner, and if you are still confused about buying the engagement ring, then consider buying an asscher cut diamond engagement ring. Diamond rings are always special. After all, who doesn’t want to own a cute diamond ring? The Asscher cut diamond rings are particularly in fashion now, loved by those who love their gems large. A sleek and square edged asscher cut engagement ring with its gorgeous brilliance will make everybody stand in awe. And of course, your spouse will just love it wearing. The asscher cut rings are fashionably styled and are expensive stones. If you don’t have a constraint with the budget, an asscher cut diamond ring can be a great engagement gift to your partner. The cut was first pioneered by the asscher clan in 1902. The Cullian Diamond stone is considered to be the most famous of the asscher cut engagement rings. Each asscher cut diamond comes with a special identification mark with a credential of genuineness. Always look for the authentication certificate while purchasing asscher cut engagement rings. If the jeweler fails to show you the authentication certificate, either it is not genuine or stolen. To know more about asscher cut engagement rings, read through this write up to know more. Diamond engagement rings are always elegant and stunning. Finding the perfect ring for that special person in your life can be a daunting task. Asscher cut rings are available in different styles and price ranges. The asscher cut was originally created by the asscher brothers of Amsterdam, Holland. The asscher cut has a typical shape like an octagon resembling a square with deeply trimmed corners. Asscher cut is a modified cushion cut and is also known as square emerald cut. The diamond is cut in a series of parallel steps to give it a hall of mirror effect. Plus, it also increases the internal reflection of the stone that adds to the brilliance of the ring. All asscher cut diamond rings have the asscher family insignia on them. While purchasing an asscher cut diamond ring, ensure that you look for this insignia. Also look for the stone’s individual identification number that should be emblazoned on the stone’s girdle. This confirms an authentic and patented asscher cut diamond. However, these signs are only visible under high magnification. Take the jewelers help to view these marks. While buying asscher cut diamond rings, check for color and clarity. The openness of the cut helps you to see the diamond clearly. Asscher cut rings are perfect for those who fancy large stones for their rings. The stone looks bigger compared to other diamonds with a comparable carat size that are cut into different shapes. So if you prefer a large stone, go for an asscher cut diamond. Asscher cut diamonds look best with white metals like platinum. Depending upon your budget, you can either opt for white gold or platinum to stud your stone with. A white metal gives great depth to the ring when compared to other metals like gold.